Does the Crenshaw Subway Coalition Have Enough Juice to Alter Metro’s Crenshaw Plans Again? The dark yellow line marks the Crenshaw Light Rail route. 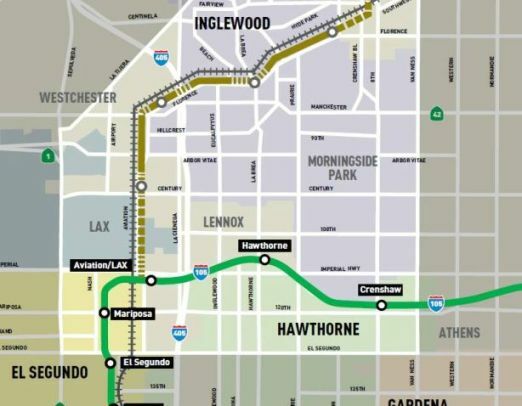 Yesterday, the Metro Board of Directors awarded the nearly $1.3 billion construction contract for the Crenshaw Line to Walsh/Shea Corridors Construction. While the decision was unanimous on the dais, it was not a popular one in the room. Dozens of speakers spoke out asking the Board to not award a contract to anyone who would not tunnel for the Crenshaw Line through an 11-block segment between 48th and 59th streets through Park Mesa Heights. Some of those speakers were as young as seven years old, and testified that they worried that the train line would kill them. For one thing, the Campaign still has a lawsuit pending over the environmental documents. It is possible, although given Metro’s winning streak against these sorts of suits it is unlikely, that a judge could rule with the Coalition and force a new environmental review. The Dodgers would love to go one for two these days. It’s also possible that when Damien Goodmon, the leader of the coalition, finally gets his hands on construction bids submitted to Metro that include the “Park Mesa Tunnel” that a public outcry will compel Metro’s Board to put the brakes on the project. Goodmon has filed multiple public records requests to the transit agency demanding their release to no avail. Metro has all-but-admitted they exist. However, a new environmental impact report would be needed to construct the tunnel and they want to build it today. And just days before the vote, a new argument against the Crenshaw Subway arose. An op/ed in the Morningside Park Chronicle, a weekly newspaper in Inglewood, charges that Metro plans to build a 30 foot wall sectioning off North Inglewood from the rest of the city. The Board is set to approve a 30-foot high, 1/4-mile long concrete wall that will isolate north Inglewood from the rest of the city. This design change was not a part the EIR process and was never disclosed to the public. Metro’s position is that adding this wall is a minor change and will not impact the community in any way. However, assuming that the lawsuit is not successful there are two reasons why a publicity campaign may not have the same impact as the ones that brought about the Leimert Park Station for Crenshaw and the Dorsey High Station for Expo. The first reason is Mark Ridley-Thomas. 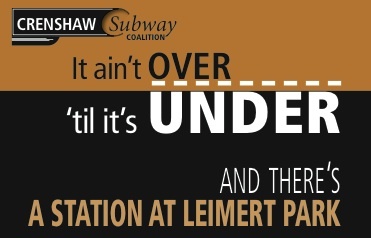 The popular County Supervisor who sits on the Metro Board of Directors is excited about the project moving forward with the Leimert Park Station and is ready to be the face of the project. In a press release, the Supervisor praised yesterday’s decision. Ridley-Thomas doesn’t just provide a spokesperson for the project, but also plays a key role in the politics of the Metro Board. He was a tireless champion of the Leimert Park Station, and without a champion it’s much harder to get the Metro Board to do anything. Second, there’s an excellent chance that more people from the Crenshaw community will be building the project. The same was not true for the Expo Line. In January 2012, Metro passed a “Construction Career Policy” requiring that at least 40% of all construction workers on Metro projects come from communities with a median income below the poverty line. Since then, the Los Angeles Alliance for a New Economy (LAANE) has worked with local unions on mentoring programs to insure that a labor force of qualified residents of South L.A. are ready to begin work on their transit line. There’s a reason that politicians and unions always sell transit projects in terms of the jobs created, all the advocacy in the world isn’t going to convince someone who has a good paying job with benefits that the project they’re working on is a bad one. The same holds true for that worker’s family and friends. So yes, the battle rages on over Crenshaw. The Subway Coalition lost in the Metro Board Room, but is ready with a lawsuit and a continuing press campaign. But with construction scheduled to start “immediately,” it might be over before it’s under, and be over pretty soon. Juice isn’t the key factor but facts. Steve Hymon in a recent post pretty well blew a hole through the arguments the Coalition has advanced. Another factor is the key stakeholders of the Crenshaw community have long sought this line and oppose anything that would delay a start of construction. The Coalition and its tunnel crusade hasn’t been very popular with them. And these are folks who Ridley-Thomas pays a lot more attention to than Mr. Goodmon et al. Stick a fork in the Coalition and declare it done. Next will be the drama of whether Mr. Goodmon is successful in his hopes to leverage this issue into a seat in the Assembly (District 54, as Holly Mitchell likely will soon run for Curren Price’s Senate seat as he shifts to the L.A. City Council). The Morningside Park Chronicle link leads to an article that does not mention the Crenshaw Line or the 30-foot wall. According to SWITRS data, between 2002 through 2011, there were about 600 fatalities or injuries from traffic collisions along Crenshaw Blvd between 48th and 59th. That is more than one per week. What are doing about that number? Can a properly-designed surface light rail line provide traffic-calming or other safety benefits that result in a net decrease in the number and severity of all traffic collisions, even if we do have some rail-car collisions? Put another way: is the goal the safest possible light-rail line, or the safest possible Crenshaw Blvd.? They might not be the same thing. This is so stupid. Are the residents that live along the Crenshaw line alignment more special than the residents that live along the Expo, Gold, Green, and Blue lines? The street-running line has all kinds of upgrades for the street running portion. The auto traffic is the real problem, not a rail line that can’t veer from tracks and is accommodated with advanced warning systems. This fear of rail is pretty ridiculous. Surface running will improve the riders experience and will help drive some economic activity when people see businesses they wouldn’t otherwise know where there. No reason to tunnel at all in this EXTREMELY WIDE corridor. Another Damien Goodmon anti-rail hysteria job. It’s actually an impressive testament to the power of political advocacy that one *misguided* man can cause so much trouble. Imagine what a few well-guided people could do with political advocacy….